Home / Mod Podge Crafts / 101 Unique & Amazing Mod Podge Uses! What can Mod Podge do?? Get 101 Mod Podge uses here! You'll be surprised at all of the things you can make: gifts, jewelry, home decor, fashion, furniture, and on and on. So many great ideas! Are you ready to learn all the Mod Podge uses in existence? Okay, this isn't a list of all of them. I've been blogging about this craft supply for ten years and I still see new things it can do at least once a week. Mod Podge is so versatile, and I'm excited to share 101 Mod Podge uses with you today. If you're new to Mod Podge, you'll definitely want to see this list. Invest in a bottle (find out where to buy Mod Podge) and a brush and get started. Mod Podge has a very short learning curve and the start up costs are nothing compared to other craft supplies and hobbies (trust me, I've tried them all!). If you've been around the block awhile, you still might find some Mod Podge uses on this list you've never seen before. I'm going to try to surprise you! We will see if I succeed (and do let me know in the comments)! For you newbies, I did want to provide some basic information about Mod Podge – what it is and what it can do. You experts might want a refresher too. I'll leave that up to you! Mod Podge is a decoupage medium. It is a glue, sealer, and finish designed for craft and art projects. Like acrylic paint, it has a formula with several ingredients. It is not watered down school glue (I've seen it being made!). 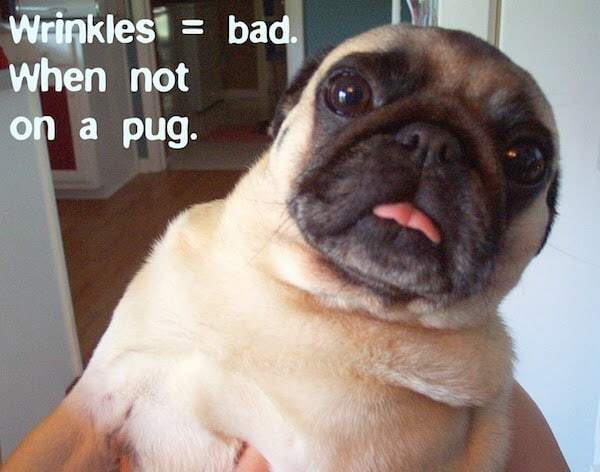 It's also non-toxic, waterbased, and made in the USA. What Do I Do with Mod Podge? You are going to use it to decoupage. Decoupage is a craft category just like knitting, scrapbooking, or stamping. It's a fancy French word that means “to cut out.” What you are (essentially) going to do is cut out shapes from something like paper or fabric, and then attach them to a surface. You will use Mod Podge to glue down the shape to the surface. Then you're going to let that dry, and add a few more layers of Mod Podge as your finish. 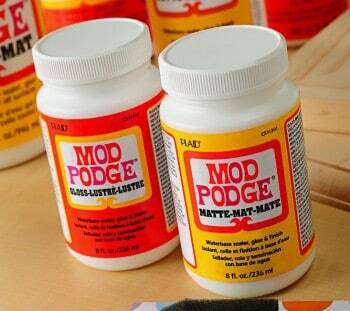 Mod Podge essentially acts as a glue, sealer, and finish in a craft project. You'll be surprised at all of the things you can make: gifts, jewelry, home decor, fashion, and on and on. That's why we're discussing 101 Mod Podge uses right here, right now. You really have to see everything to get a grasp on what this product can do! Do I sound like a salesperson? That's because I really love Mod Podge. What Surfaces Does Mod Podge Work On? Yes! I never know at any given moment how many Mod Podge formulas are in existence. That's because there are always different, cool kinds coming and going! You will need a certain type of Mod Podge depending on your project. Different Mod Podge uses require different formulas. Read my Mod Podge formula guide to learn more. Your main tools will be a set of decent paintbrushes and a bottle of Mod Podge. There are other decoupage supplies you can get that are helpful and relatively inexpensive. Otherwise you'll just need something to Mod Podge and a surface to attach it to. You should to visit our post to learn how to Mod Podge. Then you'll want to practice a bit. I recommend purchasing a $1 wood plaque or frame from the craft store for your first time. My first frame was a craft fail, but it wasn't long after that I started churning projects out with ease. I'm impressed by how many people get it right the first time! 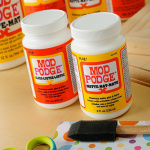 Are you ready to find out what Mod Podge can do? 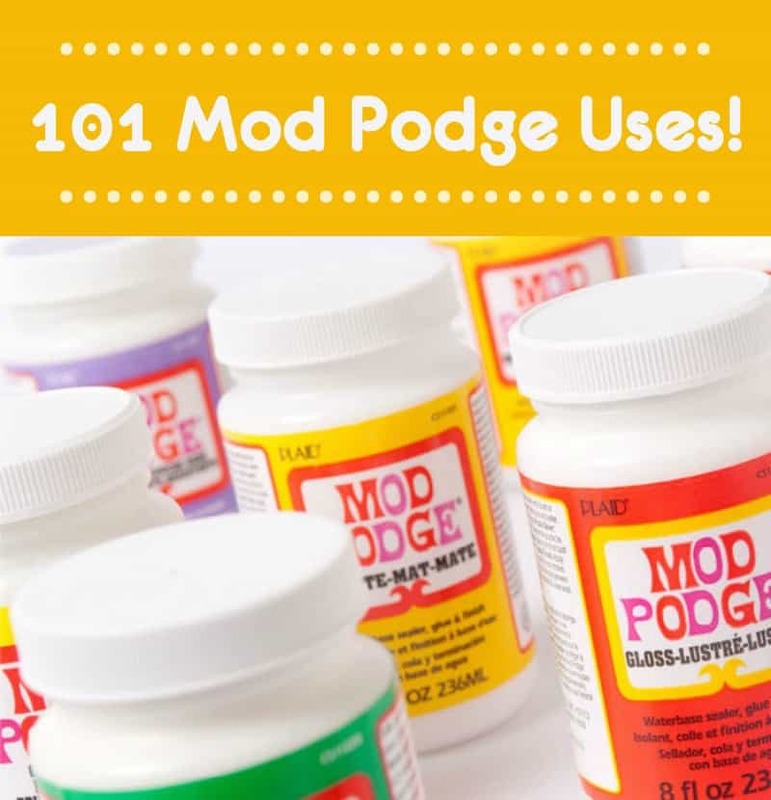 Check out over one hundred Mod Podge uses! 1. Make collage wall art. 2. Create unique faux stained glass. 3. Add maps to the tops of tile coasters. 4. Try a coastal themed DIY mailbox makeover. 5. Make a ticket bowl using a – roll of carnival tickets! 6. Add paper to hangers in this decorative coat hangers project. 7. Paint a wood storage bin; add papers to the sides and ball feet. 8. Do a Mod Podge photo transfer to fabric to decorate a pillow with a vintage image. 9. Decoupage fabric onto shelves – this works for wall shelves or book shelves. 10. Transform a paper mache letter using a map and some paint. 11. Make comic book letters and mount them on the wall (Command Strips are great for this). 12. Create photo booth canvas art with pictures of you and friends, pets, children, or family. 13. Make a DIY name plaque using coloring book pages. 14. Make a simple monogram canvas. 15. This DIY superhero canvas would look fabulous in a kids' room or man cave. 16. Use dollar bin finds to make this doily wall art. 17. Cover stool legs with wrapping paper. 18. User paper and bright paint to do a colorful table makeover. 19. Upcycle an old piece of furniture with fabric in this Mod Podge fabric table project. 20. 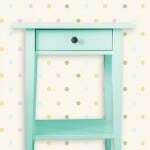 Add child's art to a dresser. 21. Transform a table in this vintage photo transfer table project. 22. Cover a chair in napkins. 23. Use book pages to create a backdrop for this cool bird in a cage on canvas. 24. Collage magazine pages to make large orange art. 25. Create beautiful art journal pages with paints, papers, Mod Podge, and more. 26. Collage old photos and trinkets into frames for this Father's Day gift. 27. Make a photo collage on a large letter. 28. Make Instagram mini canvases and turn them into magnets. 29. Do a photo transfer to glass vases using the decal method. 30. Transfer photos to wood and then either frame or display as-is. 31. Decorate glass magnets with papers and your favorite photos. 32. Make these unique photo vases using old images and PVC pipe. 33. Add photos to terra cotta pots so that the plants look like hair. 34. Use your photos to make a DIY passport holder. 35. Decorate a notebook with paper die cuts, letters, and embellishments. 36. Make these DIY lace jars and fill them with candy. 37. Use a one inch punch and your favorite papers to make a DIY frame with no wrinkles. 38. Add glitter to a mug with Dishwasher Safe Mod Podge. 39. Give a guy a present for his man cave by making these comic book coasters. 40. DIY alphabet blocks make an awesome gift for a friend with a new baby. 41. Transform a DIY clipboard with paper and paint for a teacher's gift idea. 42. Create handprint art that kids can do year after year. 43. Decorate a tray with adult coloring pages. 44. Make a DIY mouse pad using scrapbook paper and a cork circle. 45. Make night light bulb Christmas ornaments. 46. Recycle a jar and turn it into a DIY pencil holder. 47. Cover old books in fabric and use them for home decorating. 48. Decorate old Altoid tins with paper and Dimensional Magic. 49. Turn old baby clothes into a new wardrobe in this DIY onesies project. 50. Turn old jars into DIY mason jar night lights. 51. Transform a $1 frame with inexpensive scrapbook paper. 52. Cover dollar store candles with napkins. 53. Turn dollar bin doilies into bowls using Mod Podge Stiffy. 54. Decorate inexpensive bottles with vintage labels. 55. Make a DIY iPad case with a dollar store find and fabric. 56. 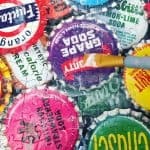 Use Mod Podge as a puzzle glue on a dollar store puzzle. 51. Glitter some glasses that are Dishwasher Safe. 52. Add confetti to a champagne bottle for a unique table number/centerpiece. 53. Use a Mod Melter to make 3-D gem drink stirrers. 54. Add napkins, doilies, and glitter to the back of glass in this dessert plate. 55. Decorate gift bags for a baby shower, birthday party, or wedding. 56. Use a Mod Mold or Mod Melter to create DIY food picks. 61. Personalize your sunglasses – two ways. 62. Make this DIY Shrinky Dink pendant necklace. 63. Use Dimensional Magic to make DIY belt buckles that will get you attention. 64. Take hardware store finds and turn them into washer necklaces. 65. Add fabric to sneakers. 66. Make DIY lace earrings (out of lace ribbon!). 67. Transfer images to clay with these image transfer pendants. 68. Add a unique faux pocket to a tee. 71. Create a DIY beanbag toss with terra cotta pot trays. 72. Use colorful images to create this unique butterfly terrarium. 73. Turn the lids of mason jars into DIY garden stakes (free printable too!). 74. Seal painted rocks with Mod Podge Outdoor. 75. Learn how to cover pots with fabric and Mod Podge the easy way. 76. These bottle cap necklaces are a perfect summer boredom idea. 77. Make this Mod Pod Podge slime recipe (with no Borax!). 78. Recycle milk cartons and turn them into fun and funky birdhouses. 79. Create your own DIY window clings. 80. Kids will love this egg carton art. 81. Preserve leaves with Mod Podge. 82. Make a DIY leaf bowl with Stiffy. 83. Decorate no-carve confetti pumpkins. 84. Use one sheet of scrapbook paper to make a simple fall sign. 85. Capture this cute ghost in a jar with Mod Podge Stiffy. 86. Create a cupcake liner Halloween wreath. 87. Make mummy Halloween luminaries with kids. 88. Recycle pill bottles into Halloween potion bottles (with free printables!). 89. Make Day of the Dead luminaries with napkins. 90. Try these handprint Halloween crafts for toddlers. 91. Make holiday handprint crafts with kids. 92. Turn old Christmas cards into magnets. 93. Make mini DIY Christmas tree decor from boxes. 94. Add confetti to your gift wrap. 95. Make Mod Podge photo Christmas ornaments. 96. Take your vacation memories and turn them into DIY glittery seashell ornaments. 97. Make a farmhouse style DIY Christmas sign. 98. Decorate lights in this glittered snowball DIY Christmas lights project. 99. Make a very easy Christmas wreath with kids. 100. Decorate a dollar store tray for a last minute Christmas celebration. 101. Create beautiful winter decor with these winter scene vases. There are so many Mod Podge uses – these are just a start. Let me know your favorite Mod Podge uses in the comments! What do you love to do with your Podge?